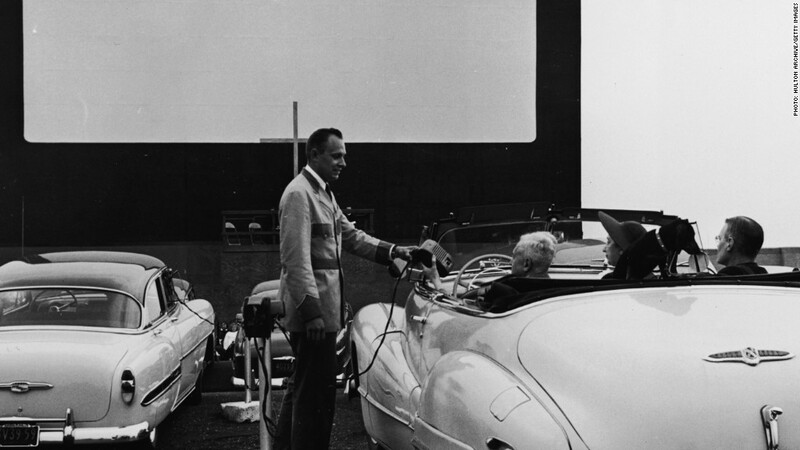 An attendant hands over a clip-on speaker at an early 1950s New York drive-in. What do you get when you mix two dying industries together? Johnny Rockets is hoping for a hit. 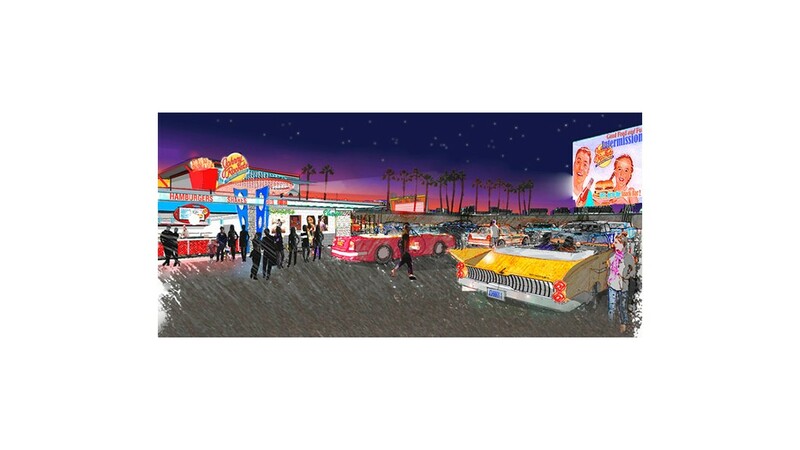 The retro diner-themed chain is collaborating with USA Drive-Ins in its quest to break out of malls and into a different way of getting food to its customers. The move comes as foot traffic at malls, where a big chunk of Johnny Rockets restaurants are located, is falling. The first five drive-ins will come early next year in either Indiana (USA Drive-Ins is headquartered in Indianapolis), Arizona or Texas, said Bill Dever, a managing director for USA Drive-Ins. The locations cost between $200,000 and $300,000 to set up, he said. Dever said his company first approached Johnny Rockets and a handful of other potential partners a few months ago about manning the theatres' concession stands, and the burger chain agreed. "Food consumption is a bigger part of the experience, which is why we're so excited about this partnership," said James Walker, chief development officer at Johnny Rockets. Rendering courtsey of USA Drive-Ins/Johnny Rockets. The venture is aimed at families who might otherwise go to a dinner and movie separately, so you're more likely to catch the latest Disney fare there than the raunchy b-movies of yore. "Americana. Fun family events. That's Johnny Rockets," Walker said. Johnny Rockets sales rose slightly between 2009 and 2013, according to research firm Technomic, but all of that growth has been international. Sales within the U.S. have been stuck around $228 million. The number of restaurants in the U.S. has been falling since a big chunk are in malls. 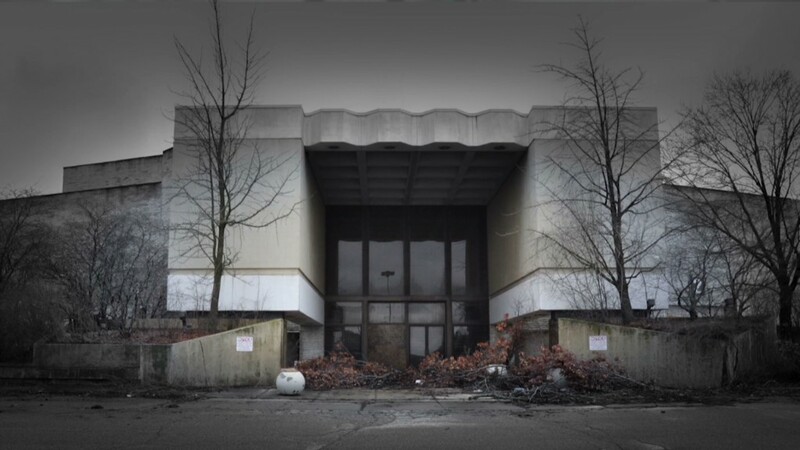 Malls are dying and taking everything down with them, from teen-focused retailers to the mall buildings themselves. "You just don't have the mall traffic since the Great Recession," said Bonnie Riggs, a restaurant analyst from research firm NPD Group. She pointed at pizza chain and food court staple Sbarro's, which declared bankruptcy earlier this year. Still, linking up the two businesses seems risky. The census bureau's county business patterns survey estimates that in 2012 there were 225 drive-in theaters left of the thousands from previous decades. And even that number is down 25% from five years earlier. Johnny Rockets isn't placing all its chips on a drive-in revival. Although USA Drive-Ins plans to open 200 new locations by 2018, Walker said his company's burgers will only be sold at between a quarter and half of them. Other growth strategies include opening drive-through restaurants and in some cases food trucks -- which might be used in locations that close down during colder months. "This is just one key to the puzzle," Walker said. Both Walker and Devers think the decline in drive-ins won't be a big impediment to the project's success, betting on the draw of novelty, food and Hollywood blockbusters to fill lots with moviegoers. "This isn't simply a movie theater, this is an event with family and friends," Walker wrote in an email.